The SCF2 Microcentrifuge from Stuart fits a versatile set of features into a compact, easy-to-use design. Offering quiet operation, the SCF2 is a variable speed unit accommodating either a fixed angle rotor holding 12 tubes or a strip tube rotor. As well as pelleting of precipitates, applications include processes involving spin column kits for binding/washing, such as sample preparation, sample clean up and sample concentration. Dr Jayne Bates, Bibby Scientific Technical Support Manager, commented: "In addition to the benefits of versatility and a compact design, the SCF2 Microcentrifuge shows Stuart's commitment to ensuring laboratory safety. The door remains locked while the rotor is in motion and the SCF2 incorporates BioCote® protection. This unique antimicrobial additive is applied during the manufacture of all Stuart benchtop laboratory equipment, dramatically cutting surface contamination for the lifetime of the product. BioCote is a silver-based finish which reduces the risk of infection by disrupting vital cellular processes within all common bacteria and fungi, including antibiotic-resistant pathogens such as MRSA." The fixed angle rotor holds up to 12 x 1.5ml or 2.2ml microfuge tubes and, using the supplied adaptors, 0.5ml and 0.2ml tubes can also be centrifuged. The strip tube rotor holds four strips of 8 x 0.2ml tubes. No tools are required to install the rotors and spin speed is variable, up to 13,500rpm for the fixed angle rotor and 6,000rpm for the strip tube rotor. 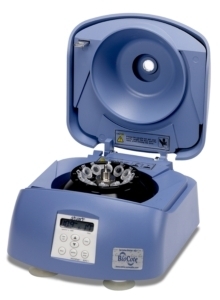 Centrifugation speed can be displayed in rpm or rcf and the timer can be set for run times of between 1 and 30 minutes. A pulse button enables rapid spin-down, with acceleration to the preset rpm followed by immediate deceleration.